Written by a 17 year old young woman after her stay in Addenbrooks. 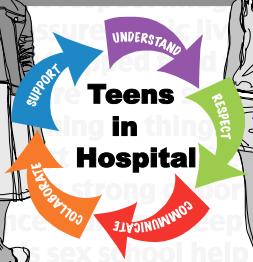 She surveyed young people and medical staff to come up with 5 key skills necessary to engage and work with young people during a hospital admission. ‘My name is Jessica and I’m 17. In January I was admitted to an adult ward in Addenbrooke’s Hospital with pneumonia, and in the three nights that I was there I witnessed amazing care of the women surrounding me but I felt that there was a gap in the confidence of many members of the clinical staff when it came to interacting with me. I decided that I wanted to understand what this gap was, what its causes were and how they could be fixed. To do this I read parenting books on bringing up teenagers, books on the teenage brain and did surveys of students at school and doctors I know. This booklet contains hints and tips on how to talk to us teens in a way that we will (hopefully) listen to. I hope it will make having 16 to 18 year olds on adult wards a little bit easier for everyone involved’. In addition to this ACTIVE have made a video based on their survey.